On 23 October 1916, two years into the Great War, Prime Minister Robert Borden spoke to Canadians with the goal of inspiring more citizens to get involved in the war effort. Nearly a century later on 22 October 2014, following the shooting at Canada’s National War Memorial in Ottawa and fears of another attack on Canadian soil, Prime Minister Stephen Harper addressed the nation to encourage unity and resilience in the Canadian people by drawing upon the previous century’s rhetoric of dedication and Canadian spirit. The proximity of the dates on which each speech was made – although ninety-eight years apart – draws them closer together temporally to emphasize the parallels in prime ministerial discourse during times of heightened national anxiety. The similarities in context and rhetoric bridge the temporal distance between the speeches, connecting the past and present. In very different eras these two Conservative Prime Ministers saw fit to assert narratives of a unified Canadian identity and of Canada’s place on the global stage, when faced with moments of national crisis. The similarities are made all the more significant by Harper’s clear determination to reshape Canada’s image from its late-20th century “peacekeeping” ideal to a “warrior nation” one instead. Another significant difference appears in the way the Prime Ministers addressed their audiences. While each speech was delivered from the Prime Minister’s Office and subsequently circulated by national news media, only Harper’s speech could reach Canadian citizens instantaneously from any mobile device. As well, Harper repeats the words “fellow Canadians,” cultivating the image of a unified Canadian people that includes the Prime Minister among them. Conversely, Borden refers to “the Canadian people” or “the people of Canada,” which similarly encourages a unified image, but places the Prime Minister or speaker outside of that collective. Harper’s more inclusive terminology reflects a shift in cultural rhetoric regarding the position of government vis-à-vis the people. Each speech clearly reflects its period; nonetheless, they bear striking similarities. 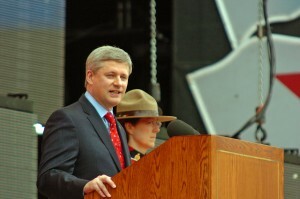 A comparison of these speeches highlights both leaders’ attempts to unify the Canadian people by linking the democratic citizen and national service. Borden’s 1916 speech builds to his climactic statement that “[i]n the history of every people there may come such a challenge to the spirit of its citizens as must be answered in service and devotion if the nation is to have an abiding peace in the future.” In 2014 Harper deliberately called to mind the earlier generation’s “service and devotion” in his declaration that “Canadians will pull together with the kind of firm solidarity that has seen our country through many challenges.” Both speeches depict the notion of the steadfast Canadian citizen, appealing to the sense of duty to ‘stand on guard’ for democracy. Borden positioned this duty to ‘stand on guard’ as Canadians becoming “trustees of the future,” where the nation and its global identity were protected by dedicated citizens. On the other hand, Harper’s speech positions Canada as a warrior nation. While the term “trustees” evokes a sense of guardianship and dedication, Harper’s speech focuses on not “being intimidated,” and combines aggressive action with the Canadian devotion expressed in Borden’s speech. This continuity demonstrates how the political rhetoric of the Great War bleeds into contemporary military identity. The parallels are especially evident in Borden’s call for “Canada [to] be strong and resolute,” which finds echoes in Harper’s assertion that “Canada will never be intimidated. In fact, this will lead us to strengthen our resolve.” The similarities in diction between the terms “resolute” and “resolve” form a bridge between the 1916 speech and the 2014 speech. While the circumstances surrounding each address differ, the similar word choice demonstrates a strikingly consistent rhetorical representation of the Canadian identity. Both speeches emphasize the importance of remembering the sacrifice that transformed the “destiny of this Dominion,” which Borden highlights as “[r]emembering the sacrifice by which that distinction [international glory] was won.” Harper compounds the idea of the sacredness of memory during a time of remembrance. He states that the 2014 attacks not only affected the individuals who lost their lives, but also the National War Memorial itself – a site that “pays tribute to those who gave their lives” – by disregarding the sanctity of the Memorial. This violent disregard positions the National War Memorial as a place that requires reclamation, and Harper highlights this idea by stating that those who bring violence to Canada “will have no safe haven.” Each speech implies that Canadian unity is strengthened by collective remembrance of the sacrifices made by a specific group of citizens during this time – largely white, European-descended men – who returned to the Old World to prove their loyalty and their nation’s maturity. The nation is not constituted of the living alone. […] So this great responsibility [of protecting and proving the nation] comes to us as heirs of the past and trustees of the future. But with that responsibility there has come something greater still, the opportunity of proving ourselves worthy of it; and I pray that this may not be lost. Borden’s speech ties together the past, present, and future citizens of Canada into this collective remembrance, right at its point of creation. By addressing the responsibility Canadians have as “heirs of the past” and “trustees of the future,” Borden reinforces not only the idea that Canada was becoming a nation during the war, but also that Canadians – specifically those who chose to help the war effort – had control over the future of the country. The challenge for Canadians in 2014 was that conflict occurred not just on a global level but also on a cultural level at home. How could Canadians of the present demonstrate that they were up to the challenge of being “heirs of the past”? Here again, Harper echoes Borden. While Borden emphasizes the qualities of sacrifice and strength in the Canadian identity on the global stage, Harper adds to these same qualities the importance of remembrance to protect Canada’s home soil (demonstrated by the protection of the National War Memorial). 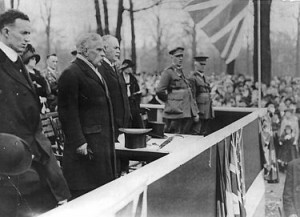 In this way, Harper’s speech draws upon Borden’s political rhetoric of enlisting for the war effort and adds his own emphasis on Canada’s history of perseverance. Considering these two prime ministerial addresses in tandem illustrates how violence and conflict continually influence the shape of Canada through the imperative to (as Harper states) “[keep] Canada safe at home,” whether that means combat abroad, or in “sacred places” on Canadian soil.